Anyone interested in going to the reception? 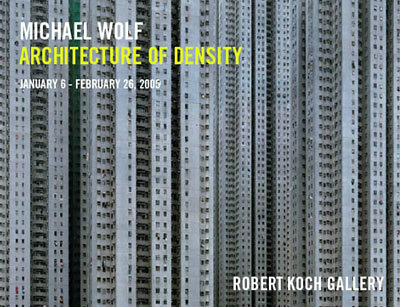 Robert Koch Gallery is pleased to present Architecture of Density, an exhibition of large scale color photographs by Michael Wolf. Wolf has lived and worked in Hong Kong for ten years. Stimulated by the region's complex urban dynamics, he makes dizzying photographs of its architecture. One of the most densely populated metropolitan areas in the world, Hong Kong has an overall density of nearly 6,700 people per square kilometer. The majority of its citizens live in flats in high-rise buildings. In Architecture of Density, Wolf investigates these vibrant city blocks, finding a mesmerizing abstraction in the buildings' facades. Some of the structures in the series are photographed without reference to the context of sky or ground, and many buildings are seen in a state of repair or construction: their walls covered with a grid of scaffolding or the soft colored curtains that protect the streets below from falling debris. From a distance, such elements become a part of the photograph's intricate design. Upon closer inspection of each photograph, the anonymous public face of the city is full of rewarding detail -- suddenly public space is private space, and large swatches of color give way to smaller pieces of people's lives. The trappings of the people are still visible here: their days inform the detail of these buildings. Bits of laundry and hanging plants pepper the tiny rectangles of windows -- the only irregularities in this orderly design. In 2002, the San Francisco Chronicle called Wolf's work in Hong Kong "most improbable and humanly alert". In previous series, Wolf described the vernacular culture of the street. His early vision of the region dwelt on personal aesthetic gestures left in back doors and alleyways, such as makeshift seating in the streets. In these photographs, small tokens of human presence took precedence over monumental architecture. Wolf continues to explore the theme of the organic metropolis -- that which develops according to the caprice of its citizens as much as the planning of its architects. In Architecture of Density, his vision has evolved to evaluate the high-rises that shape the spatial experience of Hong Kong's citizens. Wolf finds in each building a singular character, despite its functional purpose and massive form. Wolf was born in Munich, Germany in 1954. He studied first at the North Toronto Collegiate Institute in Canada, then UC Berkeley and, in the mid 1970s, with Otto Steinert at the University of Essen, in Germany. Published monographs include Sitting in China (2002) and China im Wandel (China in Transition) (2001). Hong Kong: Front Door/Back Door will be published by Thames and Hudson in 2005.